SMOK has been one of the most prolific manufacturers of box mods and box mod starter kits so far in 2017. With so many different products out there, it can be kind of confusing to try to figure out just what, exactly, the difference is between some of their products. It really doesn’t help that they insist on using the “Priv” name for so many different products. Is there really that much of a difference between an H-Priv and a G-Priv? Or between a G-Priv and a T-Priv? What do all those letters mean!? The G-Priv and the T-Priv are two of the most popular starter kits from SMOK (other than the legendary Alien, of course). Here’s an overview of these two extremely popular kits. The G-PRIV is the successor to the wildly popular H-PRIV kit. While the majority of the performance specs are basically the exact same as the H-PRIV, it features some major cosmetic and ergonomic changes that are designed to appeal to the more “techy” type of vaper. The G-PRIV is a high-tech, yet clean cut box mod. It has the standard 220W of power, dual-18650 battery configuration, wide temperature control range (200F-600F), a .35V-8V voltage range, and adjustable airflow. Unlike the previous H-PRIV, the G-PRIV eliminates the top screen and the adjustment buttons. Instead, SMOK opted to install a 2.4 inch shatter-resistant touchscreen that you can use to control most of the important features. If you opt to buy the full kit, you’ll also get the super-popular TFV8 Baby Beast sub-ohm tank for those FAT CLOUDS. It also has upgradeable firmware, so you’re mod will stay current with the latest tech for a few years at least. The T-PRIV is the newest product in the PRIV lineup of mods from SMOK. It has similar performance specs to the G-PRIV. Same wattage range, same temp control range, dual-18650, etc. The voltage range is slightly expanded, with the maximum moving from 8V up to 9V. The T-PRIV is a stunning, futuristic looking box mod. Like the other entries in the PRIV line, the T-PRIV is mainly a cosmetic and ergonomic upgrade. While the G-PRIV is more like the clean-cut J Crew model of the vaping world, the T-PRIV goes all out with the sci-fi look. 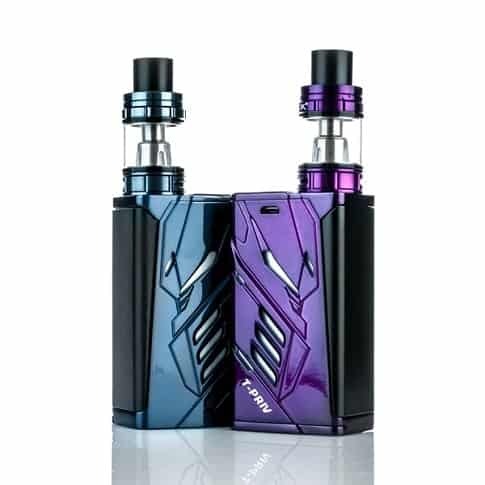 The blue and purple color choices make the T-PRIV look like it belongs on the set of Star Wars. There are some cool LED lights that are completely customizable. You can switch between 9 different LED colors: cyan, white, rainbow, yellow, blue, green, magenta, and RGB. Super cool. When you opt for the full kit, you’ll get the TFV8 Big Baby Beast sub-ohm tank. Did we already mention that it’ll give you FAT CLOUDS? Yep, we did. But it deserves repeating. The TFV8 is *the* go-to if you want something that’ll help you fog up a room without requiring too much technical expertise. Which one did you buy? Have you tried both? Help your fellow vapers make their decision by telling us which one you liked best in the comments section below! Check out our list of the best box mods of the year and find out which mod meets your unique needs! Which vape do you like better?